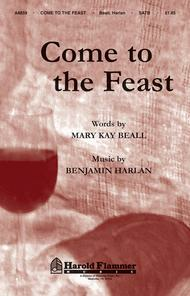 Come to the Feast for SATB choir with piano accompaniment (SATB). Communion. Shawnee Press. Supports: 1 Corinthians 11:2, Luke 22:19, I Corinthians 10:16, John 6:53-63. Sacred. 8 pages. Shawnee Press #A8859. Published by Shawnee Press (HL.35004451).